And it works. There’s a few gimmicks that you can switch off - including the use of radar to pinpoint your car, and even sonar - but the real win is the simple fact that this app is really effective at doing what it says it does. And you don’t have to use it for cars. Some people use it for geocaching, which is treasure hunting with GPS. The only time the app got confused was when we parked five storeys up. It showed us where the car was but didn’t tell us it was elevated. Minor snags aside, though, Car Locator is a winner. With AudioGalaxy you can stream your entire collection of music to your phone. AudioGalaxy is one of those few brilliant apps where you wonder how on earth it can be free. Surely there must be a catch? Apparently not. It enables you to stream your entire desktop digital music collection to your phone without taking up any sacred SD card space. You must register for a free account at Audiogalaxy.com, which detects all your music files on your hard drive. Once you’ve downloaded the app and logged in using your account, your music appears for seamless streaming to your phone over 3G or Wi-Fi. All your artists are listed, cover art and all, for you to instantly start playing. It even knows what you’ve recently played on iTunes. 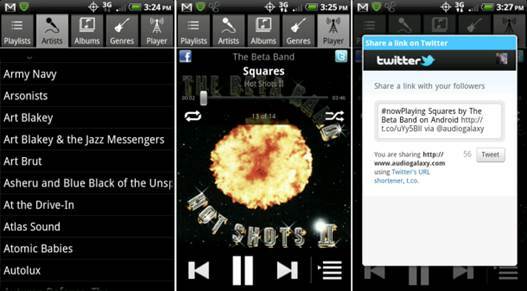 If you like, you can share your song choices on Facebook and Twitter. If you keep your computer switched on, and stay logged into your AudioGalaxy account, it gives you access to your music wherever you roam. But beware if you’re on a limited data plan because it could kill you. 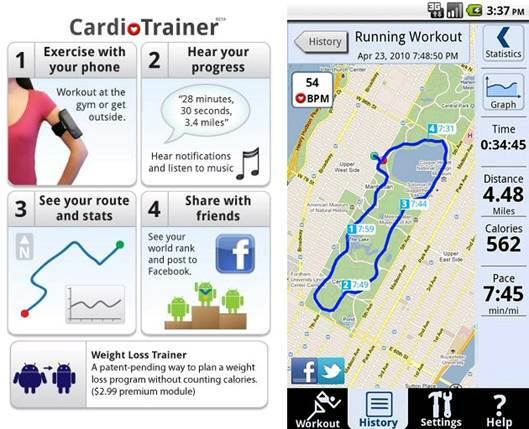 As free apps go, the Cardio Trainer gives you an awful lot of features for nothing. There are four main options, including recording your workout, a weight loss trainer and an option to race against yourself. Each one is worth a go but if all you want to do is track a run, flick on ‘Record your workout’. If you’re outside and have GPS enabled, the app charts where you run. It’s like a cut-price Nike+ but it’s important to tailor your expectations and remember that it is free. The phone recounts how many steps you have taken, the distance you’ve travelled and the speed. This can be saved and used to let you run against yourself the next time you go for a jog. If jogging isn’t your thing, there are lots of sports to choose from. 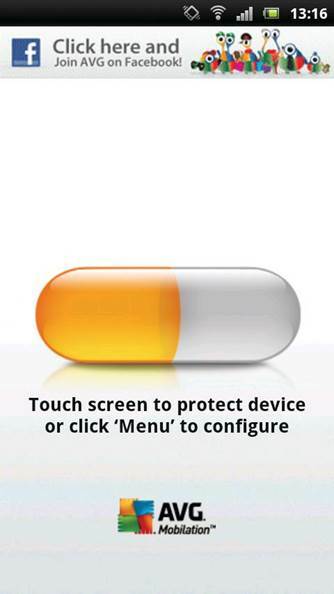 As smartphones become more open to malicious viruses, AVG has sought to tackle the issue. The free app gets to work as soon as it has downloaded from Google Play, alerting you to action as soon as you begin downloading your next app, load a new document or transfer files from another device. Every time you launch the app, it performs a scan of your apps, settings, content and media. You can then open each section to see a breakdown of what has been scanned. There is the option to turn off real-time scanning, which is a bit kinder to your battery life. As well as its security features, FindR is a phone-locator, while Task App Killer opens up your entire list of apps, so you can shut down those no longer needed. Keep a careful eye on your finances with the anMoney Personal Finance app. In these days of belt-tightening, the need to manage our money wisely is greater than ever, and that’s where this nifty little app comes in. It allows you to keep track of money going in and out of your account(s), as well as enabling you to compile budget reports and more. 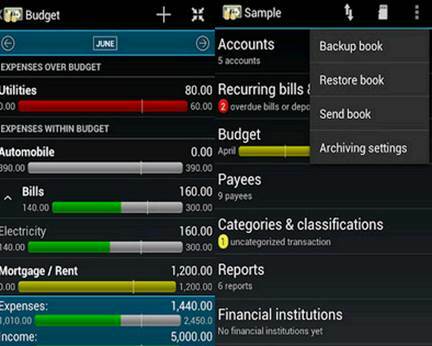 Despite being designed to handle complex accounts, the app itself is easy to use. Under each ‘book’ you can view a list of your accounts, look at recurring bills and deposits, see who you’re paying money to and set a budget, but only in the paid-for version. You get three widgets and the app covers every function you could think of, enabling you to take complete control of your money, including the ability to handle split transactions. Thankfully, it works with MS Money and Quicken export files (QIF and OFX) and despite a larger-than-average 1.4MB file size, it doesn’t play havoc with the phone’s operating speed. The only slight grumble is the price, but for that money you’re getting a fantastic app that does a great job of helping you get your finances in order. There’s so much more to Photoshop than manipulating the size of a lady’s breasts to sell magazines, or to iron out the wrinkles of a celeb who has become a melted waxwork of her former self. The powerful and rather popular image-editing program can seriously perk up even the worst photos, giving oomph to the most lackluster of images. 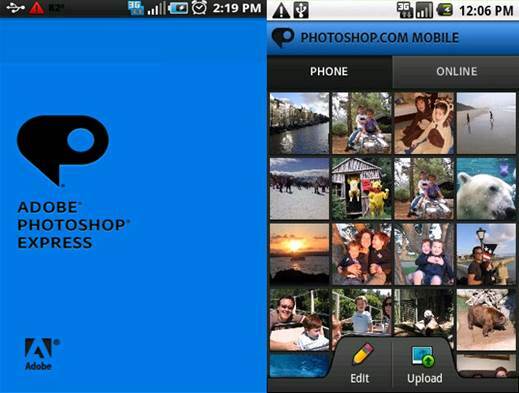 Adobe Photoshop Express for Android is a free app that can mask the inadequacies of a phone’s camera in a flash. It’s a barebones version of Photoshop but that’s not a bad thing. There’s a whole host of tools available. Those included are the most essential for image-saving, such as cropping and auto correcting, one-touch picture enhancing and the ability to add some pretty decent filters, such as sepia and black and white. You can also upload the images to the cloud at Photoshop.com, once you open up a free account with it. And the decent thing about the app is that it works with pretty much all flavors of Android. Unlike the full-fat Photoshop - which throws up more complications than a night with Charlie Sheen - Adobe really has made this app as simple as possible, which means it is essential and foolproof. Our TVs are smarter than ever and the amount we can consume is endless. This is where Zeebox comes in. 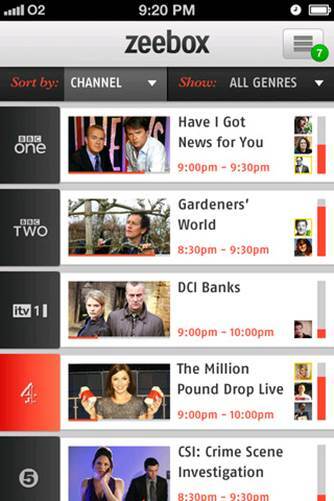 Already a hit on iOS, the TV companion app has come to Google Play in beta form and it has some big-name backing, with BSkyB offering a 10 per cent stake. Couple this with the brains behind the iPlayer (Anthony Rose heads up Zeebox) and the pieces come together to form a simple but great app. Load the app and it wants you to sign up through Twitter and Facebook. Do this and you can see what others in your social network are watching. The great thing about the app is how easily it ingrains itself in the process of TV watching. It all starts from before a show starts. This is because the app offers information about shows and the stars. It takes info from a variety of online sources and offers it up in an easy to digest way. When you have chosen what show to watch, the app begins its real work - tapping into the social feeds surrounding the show. Through something called Zeetags, you can search for actors on the show they are on, then look at any tweets about this person or the show itself. It’s all good fun and essential for anyone curious about what they’re watching.